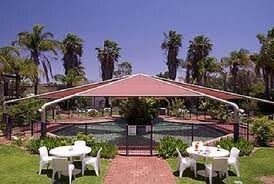 The lovely all seasons Alice Springs Oasis sits just minutes from the town centre and features 102 rooms, two pools set among tropical gardens, a spa, sauna, BBQ area, restaurant and bar. all seasons Alice Springs Oasis is ideal when exploring the attractions of Alice Springs, including Flynns Memorial and the Old Ghan train. Alice Springs is also the gateway to Ayers Rock, the Olgas and Kings Canyon. The hotel room rate includes free continental breakfast and 15 minutes free Internet access.